Explanation: Comet Lovejoy has become visible to the unaided eye. To see the comet, just go outside an hour or so after sunset and look for a fuzzy patch to the right of Orion's belt. Binoculars and a star chart may help. 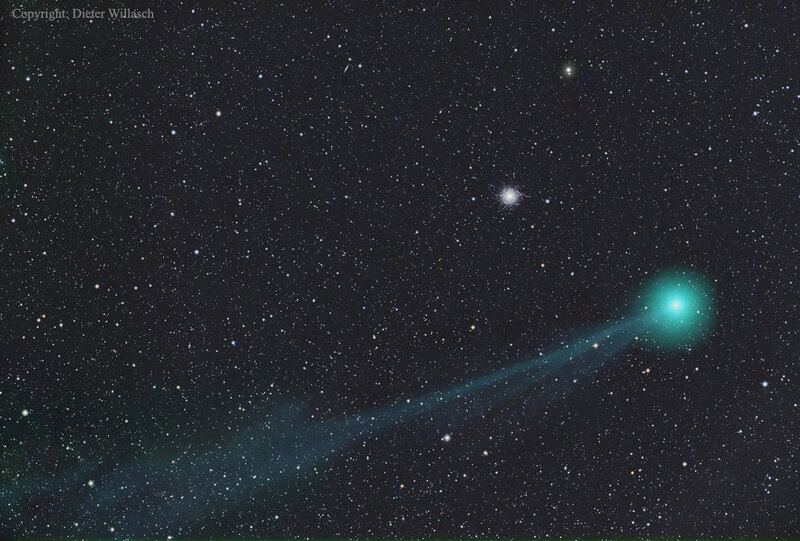 Pictured here, Comet C/2014 Q2 (Lovejoy) was captured three days ago passing nearly in front of M79, the globular star cluster visible as the bright spot slightly above and to the left of the comet's green-hued coma. The nucleus of Comet Lovejoy is a giant dirty iceberg that is shedding gas into a long and intricate ion tail, extending across the image, as it nears the Sun. The comet is expected to become even easier to spot for northern observers during January, as it is rises earlier and, hopefully, continues to brighten.